OFFICIAL NAME, AIMS, HEAD OFFICE, RANGE OF ACTIVITIES. Actions related to teaching in the field of Dual Disorders. Actions related to the information, promotion and dissemination of knowledge in the field of Dual Disorders. Actions geared towards the design, planning and management of activities, resources and processes related to Dual Disorders. Actions directed to achieve the integration of groups, associations or/and professionals at national or international levels who are working in the same areas of knowledge which constitute the objective of Dual Disorders. Actions to reduce the double stigma which Dual Disorders creates. Actions at an individual, family or social level within the range of Dual Disorders, giving special attention to socially excluded groups. To create a ‘live’ platform to serve as a point of reference to dual disorder professionals worldwide. Article 5. The Association Headquarters will be based in Madrid, Spain, at C/ Londres, 17, Zip Code 28028 and its activities will be carried out at an international scale. Formulate and submit to the General Assembly for approval the Balance sheet and Annual Accounts. Decide on the admission of new members. Any other capacity which does not fall within the competence of the General Assembly. 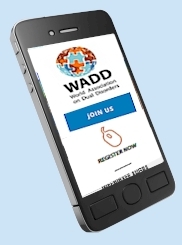 To promote and share WADD activities within their geographical area. To inform in which situation DD is in their respective zone. To advice and guide the Executive Committee on activities or iniciatives which could take place in their area. To propose to the Executive Committee for their evaluation, policies and activities to carry out in their geographical zone. Whichever other competence non attributable to any other social body. Any other which is not a conferred competence to another body. On request, to assess the Executive Committee in decision making. Founding member, those participating in the founding act/ceremony. Full Member, those who become member after the establishment of the Association. Emeritus, full members who are retiring and who wish to continue linked to the Association. A formal request, in writing has to be done and addressed to the Executive Committee. To be elected to any of the Associations’ executive or representative positions. To be part in any and all activities organized by the Association for the achievement of the Association’s purposes. Share any advantages or benefits the Association might obtain. Participate in the Assemblies with speaking and voting rights. Receive any and all the information regarding any agreements adopted by the Association representative bodies. Present suggestions/changes to the members of the Executive Committee to better fulfil the purposes of the Association. Comply with the present Statutes and valid agreements of the Assemblies and Executive Committee. Attend and vote, if appropriate, Assemblies and any other acts that might be organized by the Association. Perform, when necessary, those obligations inherent to the assignment to which they have been appointed. Emeritus members will be welcomed to Assemblies and Meetings but have no voting rights. Members who can and wish to enter this category are requested to inform the Executive Committee, in writing, of their wish. They will be exempt of the payment of any annual or other regular fee. The will have a special reduced fee when attending Congresses or other Association Events. They can be requested to cooperate with the scientific committees of the Association events, in the revision of the submitted scientific abstracts, if they wish to do so. Article 36. The Association initial Assets are of 0 Euros Article 37. The associative and financial period will be annual and will take place in coincidence with the Annual Ordinary General Assembly. Article 38.The Association will be dissolved when it is thus agreed by the Extraordinary General Assembly called to that effect, as stipulated in article 24 the present Statutes. Article 39. In case of dissolution a Liquidating Commission will be appointed which, once any pending debts are cancelled, and if there were any disposable assets left these amounts will be assigned to purposes which fulfill the Associations non for profit regulations and purposes ADDITIONAL STIPULATION In all other issues not envisaged in the present Statutes the in force Ley Organica 1/2002, of March 22, and complimentary dispositions, which regulate the Rights of Association will be applied.